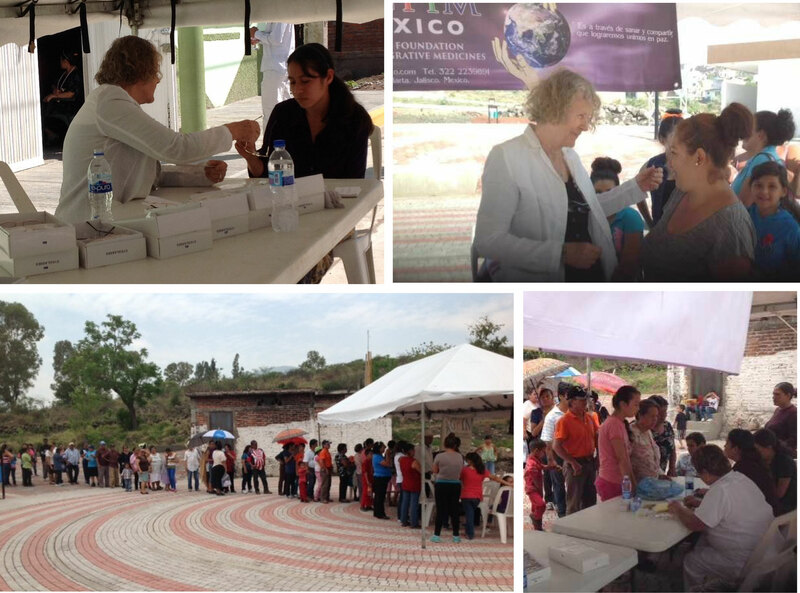 GFIM distributes free reading glasses in Michoacan, Mexico. In April of 2015 GFIM Vice President Doctor Martina Goldberg and GFIM Secretary Maria Lourdes Figueroa were in Zamora and Jacona in the state of Michoacan, Mexico to distribute under the banner of GFIM free reading glasses to those in need. During two days over 200 people had their eyesight tested and 186 pairs of glasses were dispensed. The Following article written by Marcia Blondin appeared in The Puerto Vallarta Tribune newspaper on February 19th 2015. The two-day Global Foundation for Integrative Medicines Congress is finished. A flame was reignited over the weekend and I think everyone left hoping to reunite in Puerto Vallarta again next year. Well-known Vallarta healer Doctor Martina Goldberg is vice-president of the GFIM ( and together with President Doctor Linda Lancaster )* was host of this amazing get together of doctors and medical practitioners from all over the world; each speaker touching on their own specialities. If we could have strung together the myriad of scientific degrees that crowded the conference room it would have been dozens of kilometres long. What would have been longer indeed – if it could be measured – was the sense of solidarity with the peaceful and joyous sharing of information sometimes technical but always interesting and graphically presented. The countless hours of preparation on the part of everyone involved, never mind the long distances travelled appeared to come off as effortless. The stellar company was approachable, cheerful and absolutely huggable – all of them. Held at the Fiesta Americana Hotel, the opening tone of the Congress was set: with a dozen fine mariachi singing and playing their way into the conference room and onto the stage, followed by a pair of folkloric dancers who delighted everyone. Then a troupe of Aztecan dancers replete with feathered headdresses and copal and fire. What a welcome to the lone participant from the Czech Republic who had never been to Mexico before! It was an amazing beginning with an extraordinary impact on all of us. The Mexicans (overheard in the Ladies room) chatted about how proud they felt of their Country after the opening ceremony. The rest of us were in awe. Subjects were Subtle Energies and integrating all forms of medicines from Allopathic to sound and light therapy, ways to reduce electronic (and dangerous!) smog, glucose levels, stress, photons, reversing aging, electricity, energy, chakras, food, sacred geometry, herbs, wellness, meditation, love and kindness. Names of people like Hippocrates, Jesus Christ, Albert Einstein, Andre Bovis, Nikola Telsa; place names like the Pentagon and NASA, Washington, D.C., Los Alamos, Huatulco and Prague. There were dentists, nutritionists, iridologists, a Mayan Priest, yoga Masters, Massage therapists, osteopaths, acupuncturists, musicians, translators. All healers. All with different paths. All heading in the same direction: Global Health. A healthy world will be in Peace. Here is a very interesting and informative link to The Oracle Website. Thank you Jon RG and Troya Turner for this. 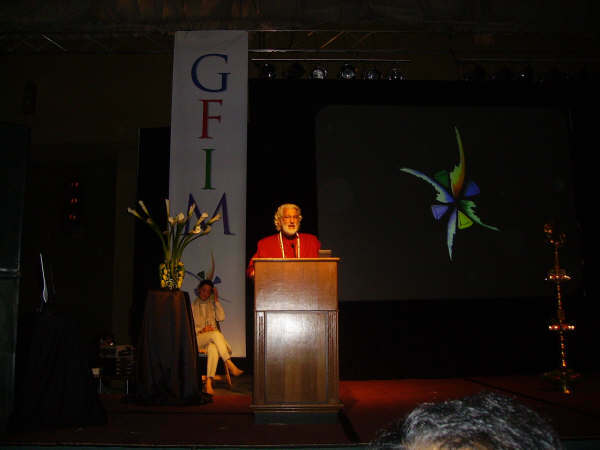 On May 4, 2007, at the Opening Ceremony of the 2007 World Conference of Integrated Medicines, delegates from more than 30 countries joined together to inaugurate the Global Foundation for Integrative Medicine (GFIM) based in Santa Fe, New Mexico with a big Bang! Banners dropped in sync with special effects at that special moment! And Voila! 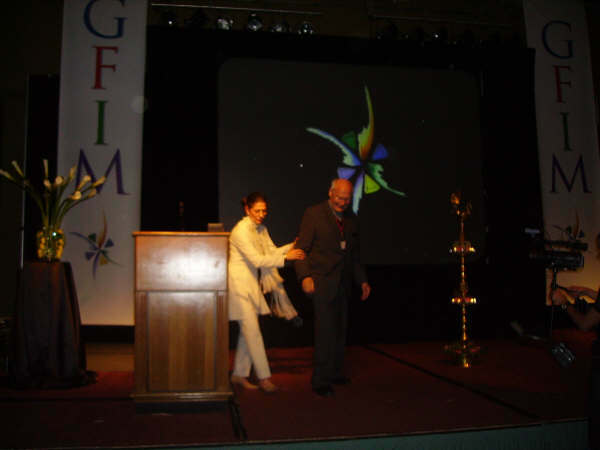 GFIM was formed through the trust of our supporters over the many years and through the initiative of the World Conference of Integrated Medicines. The proceedings began with Native American Eagle Dancers and a traditional Medicine Man, from Jemez Pueblo giving the blessing for the Conference. Native Sculptress, Estella Loretto, and GFIM in a gesture of Peace brought the 10 Ft. Bronze Peace Warrior to Santa Fe with a Peace message. Santa Fe Mayor, David Coss welcomed the delegates and thanked them for bringing Peace awareness through this unique platform of the integration of all medicines. 400 International Delegates gathered to hear Lectures and Scientific Papers on Integrative Medicine and Celebrated by sharing meals and dancing in the evenings with UNESCO Peace Ambassadors Chico and the Gypsies and Local Mariachi music and Banquets of Foods of the Southwest. The theme of the Conference is “It is through Healing we unite in Peace” Physicians, Healers, Eastern and Western Doctors, Scientists, Researchers and Advocates of Peace through the Integration of Medicine gathered for Lectures, Scientific Papers, Panel discussions and workshops given. Like-minded people networked and recognized medicine as an overlooked component of Peace. 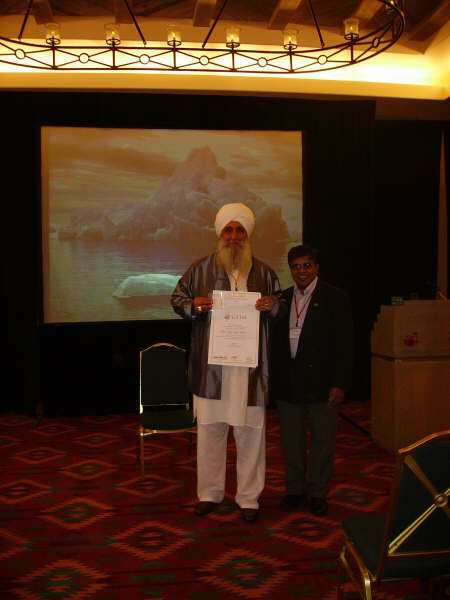 Guru Dev Singh accepting award with Dr. Harsha Jayatalake. 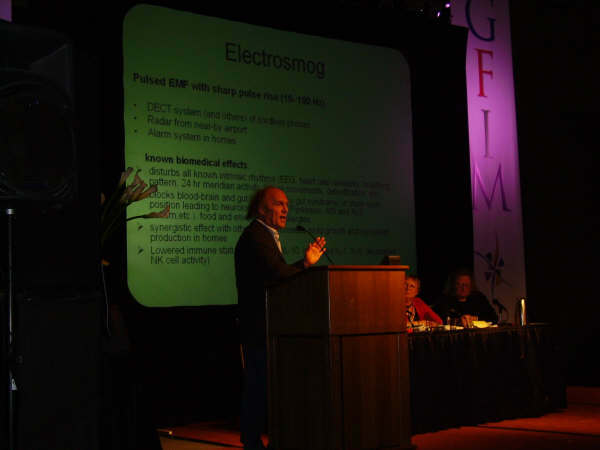 Dr. Klinghardt speaking of “The harmful effects of Electro Magnetics”. GFIM Peace Ambassador Alfredo Sfeir Younis. Chairmen Dr.Linda Lancaster and Dr. Bert Hellinger. 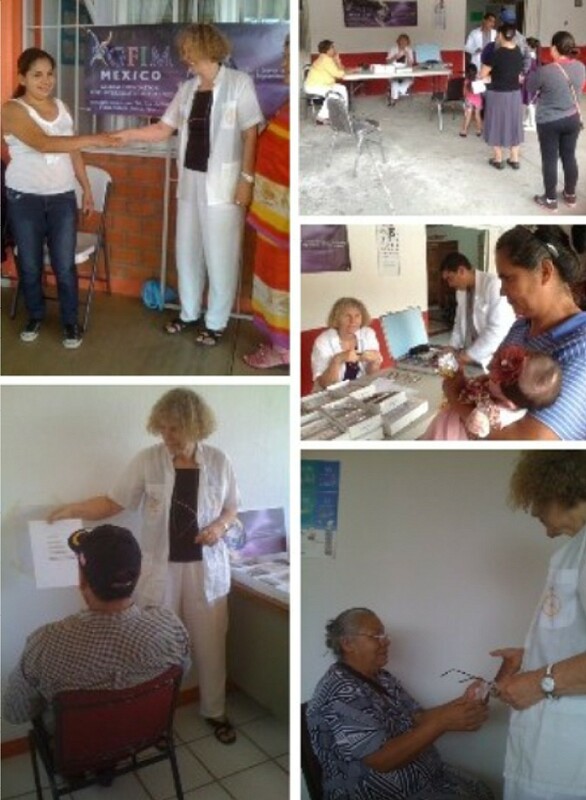 During May 2014 Dr. Martina Goldberg assisted by Maria Lourdes Figueroa and Geoffrey Watkinson made field trips under the banner of GFIM to Talpa de Allende and Jalostotitlan in the state of Jalisco, Mexico to dispense free reading glasses to 170 happy recipients. Santa Fe, New Mexico, 87505 USA.